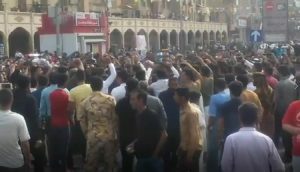 Archive- Ahvazi protesters deman the freedom or arrested protesters during their uprisings in March, 2018. The Iranian regime is showing increasing alarm in light of the recent crises facing the theocracy. Recently, a number of officials within the regime have made statements in reference to the various threats to the regime and its power. Regime’s Supreme Leader Ali Khamenei, and its President, Hassan Rouhani, also regime’s parliament speaker Ali Larijani have all made such remarks, as have a growing number of other regime officials. When analyzing the cause of this strong and vocal response by such a large variety of regime officials, including its highest leaders, it becomes clear that the mullahs are concerned about the “nationwide crises” and how to bring the country back under their control. Regime President Hassan Rouhani recently made remarks indicating that the regime would like to engage with the international committee and resume talks about their nuclear program, much as they did in talks leading up to the 2015 nuclear agreement. The decision to do this, however, lies in the hands of Supreme Leader Khamenei, who has shown no urgency to do so in his recent remarks. This contradiction between the regime leadership points to increasing crisis at the highest levels of the regime amidst increasing global isolation. the growing influence of the opposition movement, which offers a democratic alternative, specifically the National Council of Resistance of Iran (NCRI) and the Mojahedin-e Khalq (MEK). Larijani also took time in his remarks to threaten the millions of Iranians who have participated in the ongoing protests across the country, saying that Tehran will not sit idly by and adding that the regime will take serious action against those endangering the security of Iran. “The light of change is shining on Iran. The ruling regime is in disarray and paralyzed as never before. Iranian society is simmering with discontent and the international community is finally getting closer to the reality that appeasing the ruling theocracy is misguided. First, the overthrow of the ruling religious dictatorship is imperative. Second, the regime’s overthrow is within reach. Mrs. Rajavi’s words were true last year, but today they are urgent. The people have begun to rise up and demand the overthrow of the tyrannical regime. At its highest levels, Tehran is in crisis. 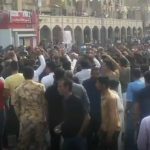 This year’s Free Iran rally is being held as protests, strikes, and demonstrations continue across Iran on a daily basis. Change is close at hand after 39 years of oppression. On June 30th, the NCRI and MEK will gather in Paris with supporters from all over the world to discuss the future of Iran and a plan for freedom.